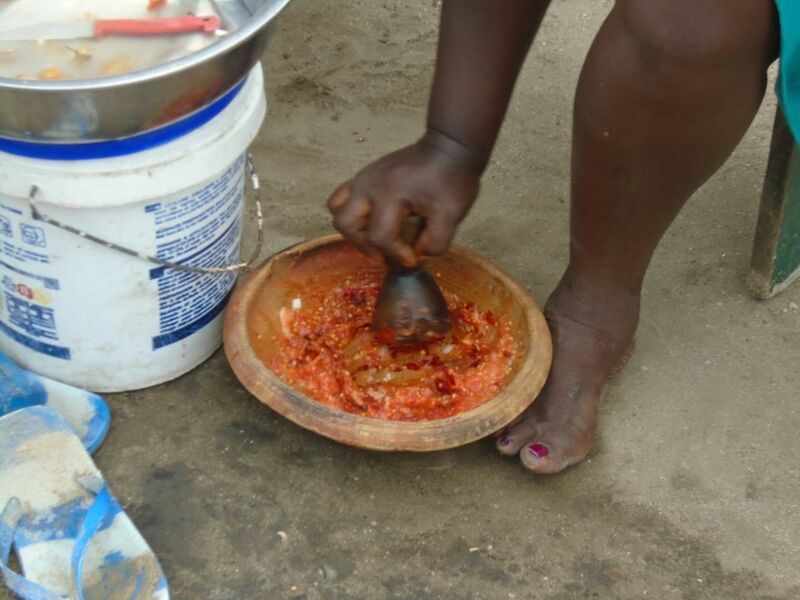 Fresh shito (pepper) sauce is a fresh tomato, onion and chili sauce much loved by Ghanaians. It is sometimes called kpakpo shito after a very popular round green pepper and is not to be confused with shito, black pepper sauce, which is cooked with dried ground crayfish. Following these steps, with the tool pictured (more details on the next step), you are guaranteed you will discover and understand how it is actually possible that this is one of Ghana's fast foods, beach or picnic foods. You can virtually make it anywhere you like! 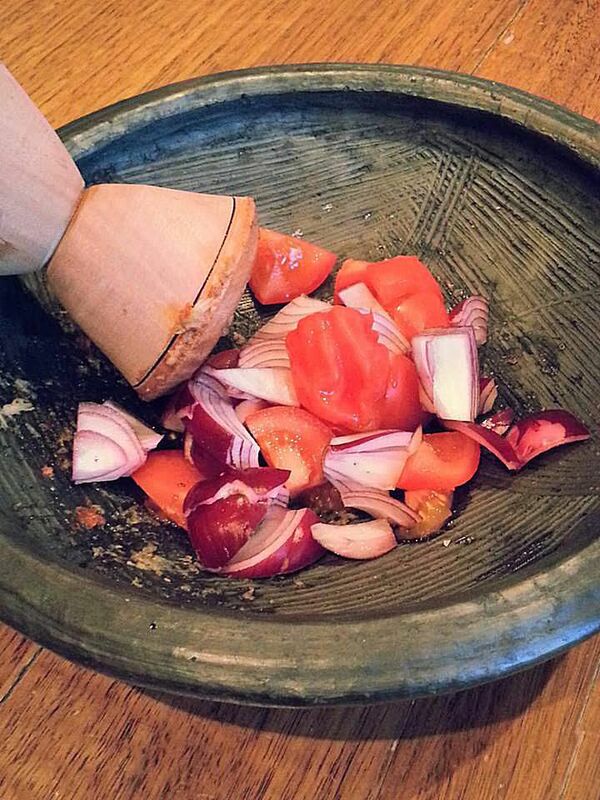 To make the sauce the traditional way, you will need the traditional Ghanaian pestle and mortar known as a kaaa or asanka depending on what language is spoken in the area (Ga and Twi respectively). This will also typically be sold with a wooden pestle. You may be able to find these at African markets. If you cannot find one, an ordinary pestle and mortar will do. Of course, the alternative is to use a hand-held blender. Grind the fresh ingredients together. If using the asanka or pestle and mortar, you will get a much easier experience with crushing and grinding the ingredients of you chop them into smaller pieces than pictured. Patience is required during this process as you will want to grind until smooth, but with a little texture remaining in the sauce. An alternative and much easier method is to throw the ingredients into a hand-held blender and pulsing until smooth. Avoid liquidizing completely as you still want a bit of texture to remain in the sauce. There is a down-side to using this method. Apart from not achieving the authentic flavor that is said to be released by the crushing and grinding method, you will also not be able to use a handheld blender at the beach or on a picnic! The fresh shito sauce is served best with grilled fish, fried fish, sardines or even corned beef. Ghana style fish and chips are shown above. A typically festive West African summer spread with fresh shito, cooked black shito made with ground crayfish and kenkey. This is by far a favorite Ghanaian meal and you will often serve kenkey with shito and grilled tilapia or fried fish.